Posted December 31st, 2018 by Tamara Tucker & filed under Contracts. We have had a record-setting year for rain here in Virginia. And when you have a small horse property on red clay, on the side of a hill, that means MUD. A lot of MUD. The paddock that I use for my two retired horses has two gates. Both gate areas are the muddiest they have ever been despite my remediation efforts, so I alternate gates when turning the retirees in and out. 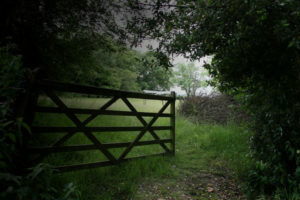 Recently, in an early morning, pre-caffeine haze, I apparently lost track of which gate I was using when, and I turned the horses out through one gate but didn’t shut the other gate. We all know that if there is a way for horses to find trouble, they will. But on this particular day, when I went to bring them in, they somehow had spent the day without discovering that the second gate was open. Knowing that Murphy’s Law applies to horses, seemingly without fail, I was surprised that Murphy had taken the day off. And that got me to thinking about a recent opinion by the Supreme Court of Virginia. Day in and day out, thousands (millions?) of contracts are performed without a hitch even when the written document is imperfect in some meaningful way (we lawyers euphemistically refer to those contracts as “inartfully drafted”). Like my horses who remained in their paddock blissfully unaware of a potential (mis)adventure into our soggy yard and gardens, the people who are parties to these contracts often remain blissfully unaware of the potential legal pitfalls that could have ensnared them. Needless to say, not all agreements result in smooth sailing, and when the agreements fail to fully and accurately document the agreement and expectations of both parties, bad things happen as in the case of CGI Federal, Inc. v. FCI Federal, Inc., 295 Va. 506 (2018). The very nutshell version of this federal contracting case is that two companies entered into a teaming agreement to bid on government work. As is common with federal contracts, small businesses and large businesses often need each other in order to fulfill the requirements of a federal bid. In this case, FCI, the small business, was to be the prime contractor and CGI, the large business, was to be the subcontractor. Despite CGI’s expectation that it would receive a specific percentage of work as a subcontractor if the contract was awarded to FCI, the teaming agreement stated, in addition to terms about division of work, that the parties would enter into negotiations for the terms of a subcontract if the contract was awarded. After the contract was awarded, a falling-out between the two companies occurred, and CGI was not given a subcontract by FCI. CGI sued on alternate theories: breach of the teaming agreement and unjust enrichment (an equitable remedy that creates an implied contract when an express contract does not exist). The Va. Supreme Court found that the teaming agreement was merely “an agreement to agree” because it stated that the subcontract would be negotiated in the future if and when the prime contract was awarded. Because the terms of the teaming agreement regarding the division of work were not definite enough and were contradicted by the terms about future negotiations, FCI was not liable for failing to award a subcontract to CGI. And because CGI had gone forward with its breach of contract claim, the Court found that it had affirmed the express contract, and, as a result, could not recover for its work and value in submitting the bid. CGI was not able to recover for its lost opportunity to work on the $145 million contract or for its work in preparing, and for the value added to, the successful bid. So, what does this case have to do with leaving a paddock gate open? By entering into an agreement that didn’t have definite and thorough terms, CGI left the paddock gate open and FCI was able to walk out. The contract principles reiterated by the Court in this case are applicable to all types of contracts, from horse sales and lease agreements to complex government contracts. Regardless of the subject matter, it is imperative that contracts encompass the full agreement of the parties in unambiguous language. Tamara Tucker is an attorney licensed in Virginia and South Carolina. She practices civil trial and appellate work, serves as outside general counsel for government contractors, and combines her horse and legal experience to serve clients in the unique world of the equine industry.